The battle for king of the iPad text editor heap has a new contender: Writings. It faces off against the likes of Elements, PlainText, and WriteRoom, but it has a plenty of nice tricks up its sleeves that make it a worthy competitor in this increasingly crowded arena. Writings offers a hefty number of features for its initial release, including letting you specify the font face, font size, text width, and text and background colors (there’s even an inverted mode). A real-time counter allows you to keep track of the number of characters, words, and lines in your document and even lets you check just the selected text. There’s also built-in support for TextExpander and the ability to quickly enable or disable spellcheck. For my money, though, the coolest text-related feature in Writings is that tapping in the left or right margin of your document lets you move the cursor by a single character. If you’ve ever grumbled about getting iOS’s text-selection loupe in just the right place, you’ll probably appreciate this functionality. 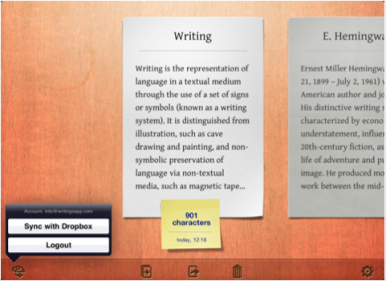 Like many of its competitors, Writings integrates with online storage service Dropbox, letting you store and retrieve your documents from the network. In addition, you can e-mail your documents—either as part of the message body or an attachment—or access your documents via iTunes’s File Sharing feature. Writings costs $5 and is compatible with any iPad running iOS 3.2 or later.